How will energy gobbling giants China and India square their anti-Western rhetoric with the need for cogent action on cleaner fuels and climate change? 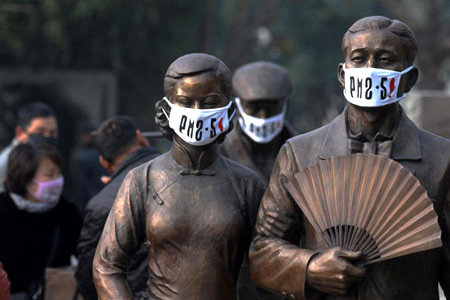 China's energy cost in terms of clean air: Wuhan pollution protest - statues wear masks citing dangerous airborne particulate matter readings. India struggles with the same. TYPHOONS of change are buffeting world energy markets from all points of the compass, and Asia is bearing the brunt of the storms. The energy policies of China and India, the region’s two largest energy consumers, which together represent over a quarter of world primary energy consumption, will be hit by the fiercest winds. In play is the level of world energy prices – as Asian demand growth sets the world market tone – and dominance of the low-carbon energy market. Longer term, at stake are seats at the “high table” of world climate change diplomacy for China and India. Security of supply issues also feature, given the open wounds of the ever-volatile Middle East. The past decade has seen the industrialised countries grouped in the Organisation for Economic Cooperation and Development (OECD) increasingly detach themselves technically and geographically from traditional fossil fuel supply sources. The tight oil and shale gas boom in the US made it the world’s largest hydrocarbon liquids producer in 2014, and shale-produced natural gas is displacing coal as a power generation fuel. US oil imports fell to 27 percent of total consumption in that year, the lowest level since 1985, according to the US Energy Information Administration (EIA). In fact, were it not for Saudi Arabian ownership of US oil refining and petrochemical plants, the US probably wouldn’t be importing more than a trickle of Middle Eastern oil. Meanwhile, a decade-long renewable energy boom has helped crimp energy demand in Europe. There, oil demand has been flat for a decade, while gas use has fallen 22 percent over the same period. Across the OECD, saturation of the auto pool and rising energy efficiency are decoupling energy demand from economic growth. According to the latest issue of BP’s respected annual Statistical Review of World Energy, while world primary energy use grew 0.9 percent in 2014, energy demand in OECD countries fell by 0.9 percent, and grew 2.4 percent in the emerging economies. Asian countries accounted for the vast majority of that growth, led by China’s 2.6 percent increase, and India’s stratospheric 7.1 percent rise. A consequence of this split in energy efficiency between OECD and emerging economies is each group’s position vis-a-vis climate change. When the United Nations Conference on Climate Change opens in Paris this November, emerging economies will be facing an OECD whose greenhouse gas emissions are diminishing, while their own are rising, increasing their historically important cumulative emissions. China and India, as the largest emerging market emitters, will need to find a way to square their desire for a seat at the head table of international climate diplomacy, which would consolidate their de facto economic weight, with their historical rhetoric blaming developed countries for the deleterious effects of climate change. Stormy weather is indeed blowing across the global energy markets. Before examining policy consequences, it’s worth reviewing the last year’s market developments. Oil, gas, coal, and renewables markets have all evolved significantly over the past year, with significant consequences for Asian governments. Where China and India lead, many other regional economies will need to follow. Since November, when Organisation of Petroleum Exporting Countries (OPEC) oil ministers decided – in renewable-power-conscious Vienna, Austria -- to defend their countries’ share of the oil market, OPEC oil output has drifted up by about 1.5 million barrels a day (b/d) to around 31.5 million b/d. World oil prices are now less than half what they were in November, with benchmark oils trading around US$45 a barrel (dlrs/b) – and may fall further if producers continue aggressively to push into saturated markets. Meanwhile, prices in world gas markets – home to the hopes of all of many looking for a “bridge” from the world’s dirty hydrocarbon past to the clear skies of a renewables-powered future – have also roughly halved. This is partly because gas prices are broadly linked to oil, but also because very large new gas resources are being brought on stream, particularly from the US, Australia, and East Africa. Major gas reserves are also awaiting development in the Eastern Mediterranean, while China is estimated to hold the world’s largest shale gas reserves. All these resources are competing for energy space. BP’s latest annual Energy Outlook 2035 forecasts that world gas demand will rise by 1.9 percent a year through 2035. Within that, BP expects liquefied natural gas (LNG) output to grow by 7.8 percent annually through 2020, as Asia overall accounts for over 70 percent of world LNG demand; and to be the dominant form of traded gas by 2035. Pipeline gas deliveries [are expected to grow more slowly, mainly through pipeline connections between Russia and China. Asian markets now witness competition between oil and gas producers struggling to maintain production levels and market share as developed country markets shrink, or contract exports of US oil and LNG. Much oil that only a few years ago had a natural home in the energy-hungry US has been displaced by the “shale revolution”. OECD oil use has fallen for eight of the past nine years, including a 1.2 percent drop in 2014, according to BP. Finally, Iran’s full-scale return to the market after years of sanctions could add a million barrels a day to the market, much of which is expected to flow to Asia. Coal has been the big short-term loser in most world markets, as it cedes ground to gas in the US on price and environmental grounds, and struggles to hold on to European demand. Despite coal producers selling the fuel at ever lower prices as gas chases it from its home in power generation, many coal markets are contracting. The big exception is India. BP estimates that India’s coal burn rose 6.4 percent last year on the back of a rise in domestic output and higher power consumption. Chinese coal consumption appears to be stabilising after a nearly two-decade-long growth run, as power generation demand is met by cleaner gas-fired options and nuclear expansion. While Asia is the hub of world energy consumption growth, non-CO2 power generation technology, including both nuclear and renewables, is competing there with fossil fuels. China is now the world’s largest new-build nuclear power, wind, and solar photovoltaic market. India has charted a route to a major solar power generation program even as its coal consumption rises. As in OECD economies, renewables and nuclear power generation will in the near term likely limit the growth of coal rather than that of gas and liquid hydrocarbons in the energy mix. China’s position as the world’s largest solar panel manufacturer, hosting six of the world’s 10 largest solar panel producers; and India’s resisting the allure of protecting its solar power industry with anti-dumping tariffs, will play a big part in this change. So will a region-wide emphasis on energy efficiency that Asian countries are implementing. The catalogue of pressures on energy prices is long, and most suggest lower wholesale rates. But these pressures aren’t likely to make life cheaper for Asian energy consumers: governments in many countries are taking the opportunity offered by lower oil prices to raise taxes on oil products and impose clean-fuel specifications, aiming at promoting energy efficiency and improving state finances by eliminating wasteful subsidies. India and China have both repeatedly raised energy taxes and promoted improved auto fuel specifications to encourage efficient energy use and restrict greenhouse gas emissions. Such taxes are only part of the armoury the two Asian demand giants will need to put in place to address pressure that will be brought on them at The November 2015 UN Climate Change Conference. Historically, both China and India have aligned themselves with other emerging economies’ argument that developed countries should bear the burden of climate change costs. But India’s and China’s emergence as economic powerhouses and the rise of their own emissions, has recently encouraged them to adapt their positions to promote a global agreement in Paris. Just before OPEC decided to fight for its oil market share at the expense of price, the US and China agreed to work together for a positive outcome at the UN Climate Change Conference; and to collaborate on energy efficiency and clean coal technology. India has yet to announce a similarly scaled initiative, but recent reports suggest that it isn’t now averse to softening its attitude in the interest of further integrating its rapidly-developing economy with that of the rest of the world. If India, China, and the US present a collaborative front to the talks, which leads to an agreement, then the climate change and fuels narrative in the Asian market will change considerably. And China and India will have established themselves as essential partners in the increasingly important diplomacy of climate change. Any climate change agreement is expected to make heavy use of energy efficiency in meeting its goals. China has set a target of increasing its energy intensity by 3.9 percent a year, which translates into maintaining its favourable cost advantages over other manufacturing nations, as it recognises that much of its labour cost advantage disappears at times of high energy prices because it is so much less efficient than its lean-energy counterparts. The shift in its emphasis from an investment and production-led to a service- and consumption-led economy will also contribute to this. China’s energy and economic progress is intimately bound to these changes in its energy-use structure. Despite an ambitious program that aims to install 100 gigawatts of renewable power generation capacity by 2022, India has failed so far to provide the necessary infrastructure, financing and pricing mechanisms to push ahead with a more energy-efficient economy. According to the World Bank, poor governance and regulatory environments and constant political influence have kept the country from developing an efficient distribution network, particularly in power generation. The country also likely will continue to depend on coal for power generation, as it has the world’s fourth largest coal reserves. Meanwhile, the two power-hungry Asian giants will need to diversify their energy sources and demonstrate considerable diplomatic agility. Buyers now have a choice as US oil production remains at record levels, balancing increased OPEC oil output. Oil exports from the US look likely to resume this year or next, after a four-decade hiatus since the mid-1970s. West African oil which once was sucked up by US demand is now regularly travelling east, while Iran’s full-scale return to the oil market this coming year will contribute to the cornucopia of supply. On the gas front, in addition to the widely-touted gas pipelines from Russia’s East Siberia region to China, new LNG supplies from Australia, Papua New Guinea, and North America will challenge the traditional import sources of the Middle East with high volume and more flexible pricing. New LNG projects in East Africa and from the East Mediterranean will contribute to the pressure. From Asia’s vantage point, it will be important to deliver the domestic transmission and distribution networks that will efficiently deliver gas to consumers. Yet all this energy movement will leave the region a net importer of energy. China is now snapping at the heels of world-leader the US as an oil importer, and India is the world’s third-largest importer, outstripping OECD member Japan. North America, long the ultimate oil destination because of the US’s insatiable thirst for fossil fuels, is now substantially balanced. This raises the geopolitical question of who will take responsibility for the defence of the sea lanes carrying streams of crude to Asia’s key markets. One longstanding fear of world oil markets has been the closure, by a warring country or by terrorists, of the straits of Hormuz between Iran and Oman. Such a closure would shut one of the world’s key oil and gas logistics arteries, through which an estimated 20 percent of the world’s oil flows every day. New infrastructure recently put in place, which aims at bypassing the strait, wouldn’t prevent a massive loss of energy flow. In the past, the market has assumed that the US Navy would undertake defence of the strait – as indeed it did, and of the entire Persian Gulf, during the 1980-1988 Iran-Iraq and 1990-1991 Kuwait-Iraq wars. The US fifth fleet, with two aircraft carriers and some 20,000 sailors and marines, is still headquartered in Bahrain. But with North America substantially self-sufficient in energy resources, how long will it be before pointed questions begin to be asked in Washington as to why so much treasure is being spent to defend energy shipments that benefit other economies, particularly China’s. On the other hand, what would be the US diplomatic reaction to a major build-up of maritime power by China, India, or both, in the area? Already the US and China are at apparent loggerheads over China’s territorial claims in the South China Sea, recent brushes with Japan, and visits to the Arctic. What would be the US reaction to China’s and India’s eventually ability to project long-range naval forces into the Persian Gulf? Or is that what, over the longer term, China and India could most easily live with? Would they be happy to continue to outsource the defence of their seaborne energy logistics to an obliging superpower, who in turn outsources key industry manufacturing and back offices to them? Such policy might keep the superpower distracted by regional security responsibilities while they continue to consolidate their economic growth and increased competitiveness vis-a-vis the rest of the world. Is it better to build a big navy, or to piggyback on the world’s policeman, hoping the policeman doesn’t get too tired? Oil. Gas. Renewables. Climate change. Diplomacy. All are in flux. The changes buffeting the energy markets today are tossing up questions that won’t easily be answered anytime soon. Bill Barnes is a consultant in the power generation and oil and gas sectors, based in London. He advises on the development of large-scale conventional and solar power generation projects and natural gas contracting. Bill holds degrees from London Business School and from Davidson College in the USA. Good background on energy and future directions. It may be a while yet before Iran is allowed to assume a big role on the oil stage but it could be the determining factor on price and new alignments. Who is to police Hormuz is the big question as armed guards on ships is clearly not a permanent - or safe - solution. Excellent article and some very interesting ideas. One issue to debate however is whether oil prices will remain at current levels. Even with slowing growth in China, both China & India are creating in GDP terms the equivalent of a Germany every 4-5 years....that sort of growth will ensure oil prices will go up and not remain at current subdued levels.